Sergio Pitamitz was born in Italy in 1968, he has italian and french citizenships. His photography career began in F1 racing and reportage photography. 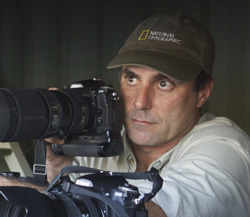 His curiosity for foreign cultures and and love for traveling soon lead him to the geographical reportage, then his passion for natural world and Africa led him to wildlife photography and now he shots both documentary travel and wildlife photography. In 1996, he became a contract photographer for the French agency Sipa Press, one of the world's top three photojournalism agencies. His work has taken him to every continent in over 70 countries around the world, from Americas to Australia, from Arctic to Antarctica, from Africa to Asia and Middle East. Extensively published, his work has been featured in numerous magazines, books, travel guides and appeared on AD campaigns, among them Newsweek, Figaro Magazine, Le Point, Condé Nast Traveller, Panorama Travel, In Viaggio, Oasis, Travel and Leisure, Geo Magazine, Lonely Planet, Stern, The New York Times, CNN Traveller, International Herald Tribune, Africa Geographic, The Guardian and various magazines and books of National Geographic Society. He is a National Geographic Society contract photographer.